We no longer carry the 1993-95 Longtube Header, 1 5/8" Primaries, 3' Collector Black. 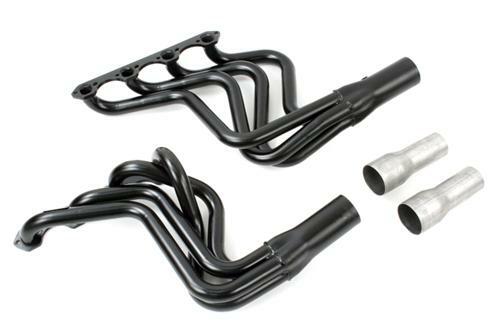 Get your hands on these affordable long tube headers for your 5.8L SVT Lightning pickup! QuikTrip Long Tube Headers are made in the U.S. PaceSetter has been designing and making quality, value priced headers and exhaust systems since 1972! QuikTrip Long Tube Headers are as good as you can get for street/strip performance on your 1993-95 SVT Ford Lightning pickup. - CNC-machined 3/8"-thick steel flanges are matched to exhaust port profile for optimum seal and flow. - Flash-controlled 16-gauge carbon steel primaries provide greater durability than light gauge stainless steel. - Length and diameter of mandrel-bent tubing is optimized for flow and best performance increase. - Tubes enter collector in proper sequence for maximum scavenging. - O2 sensor fittings on all applications. - Complete with necessary gaskets and fasteners for installation.